Yesterday my family and I went to a small beach in a recreation center. It was the perfect, sunny, warm day for it. I waded up to my waist in the water, watching the kids splash around. I tossed a football back and forth with them. Smiled as they wondered at the awe of a hovering dragonfly. I felt the sun singing my shoulders, so I retreated to my chair on the shore. 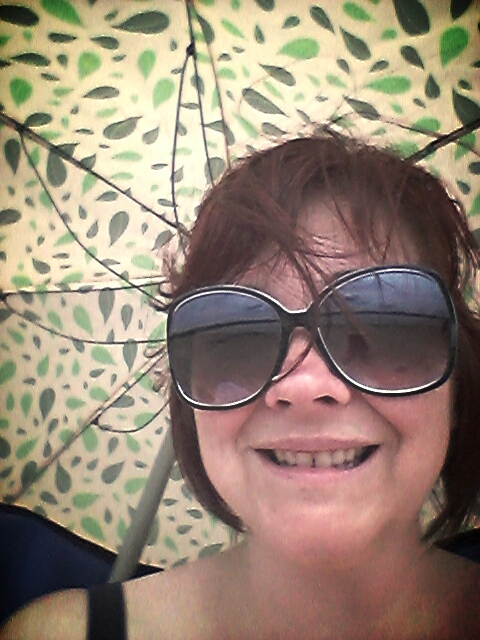 My husband had thought ahead, knowing how prone I am to turning into a lobster, and packed an umbrella from a water table we had when the kids were tiny. 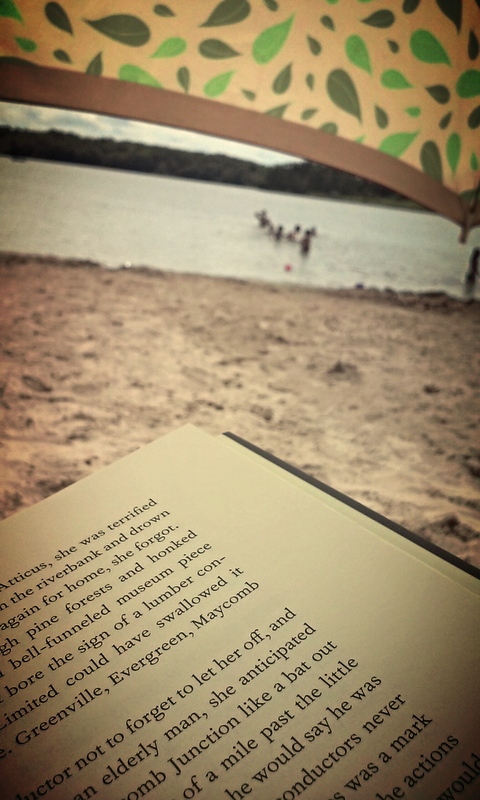 I stuck the thing in the sand, grateful for the shade and for my unopened copy of Go Set a Watchman. That was until the wind picked up and turned my umbrella inside out. Then the wind whipped under it, trying to carry the darn thing away. I grabbed hold of it. It seemed every time I started reading my book the wind started causing problems and I had to stop and right my shade. Well, not the most flattering picture…but…oh well. crawl (he doesn’t know who Gollum is, but does THE best impression of him). Let’s just say that by the end of our time at the beach, I’d read 3 pages. And let’s also say that it was fine by me. As much as I love to read, life happens around me. I need to be mindful and ready to pay attention to my kids and husband, to the wonder of creation, to the image bearers around me. I can always read later. Life doesn’t wait for me to finish a chapter. There’s a story to be lived that can’t be found on a page. Sometimes it’s found with sand in between toes, skin blushing in the sun, with a smile on the face because this story of mine – the one I live – is very, very good. Amen! This is the story of life, and life on earth passes so quickly.Prioritize. Reading is my time away from the problems in the world, but those moments in time with family cannot be repeated like re-reading a page in a book. We only have one chance to capture the rare moments that makes life so amazing. The time for reading will come later, once the children are in bed, or in my case when I come back up the hill to my own home after spending one of those awe-filled days with my grandloves. Enjoy the dragonflies in life with those precious children while you can. I just keep thinking about how soon school will start and how they’ll be there for hours and hours every day. It makes my time with them in the summer even more important.